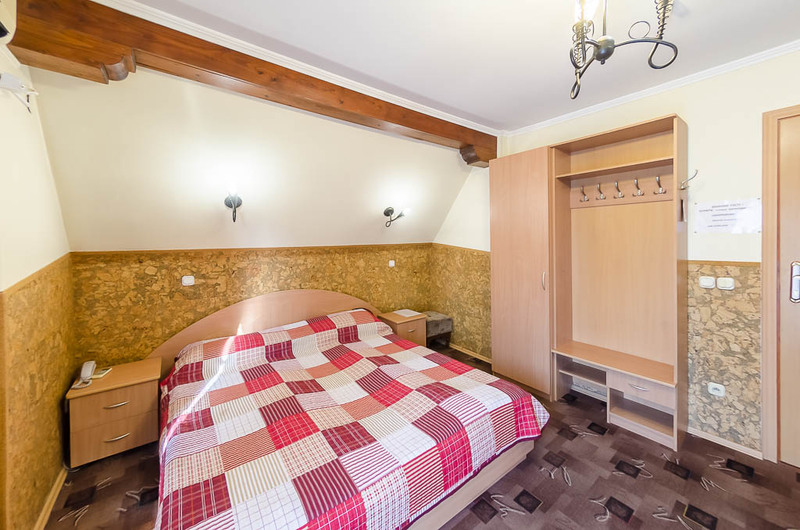 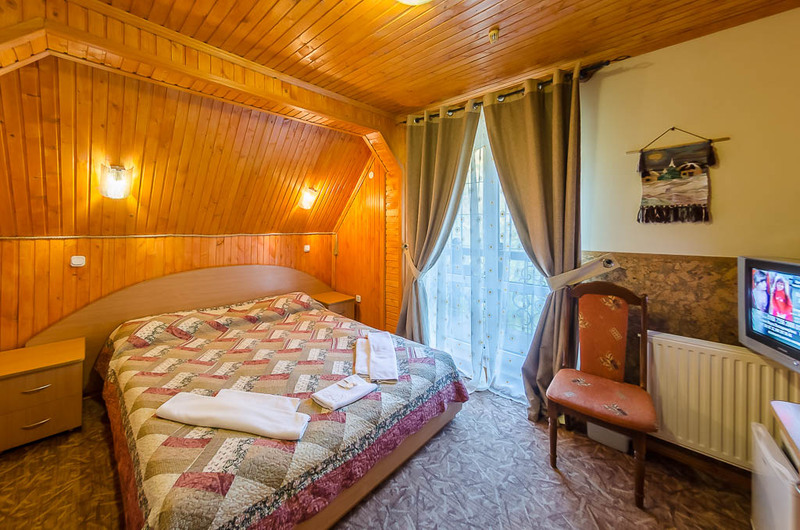 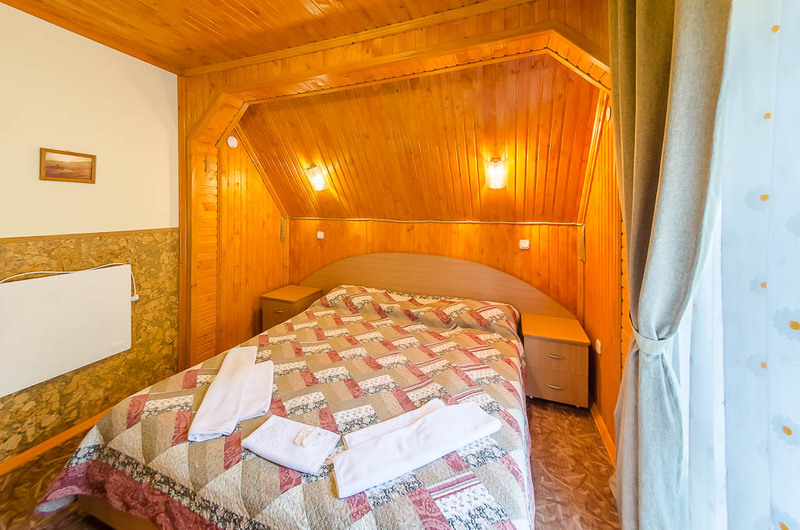 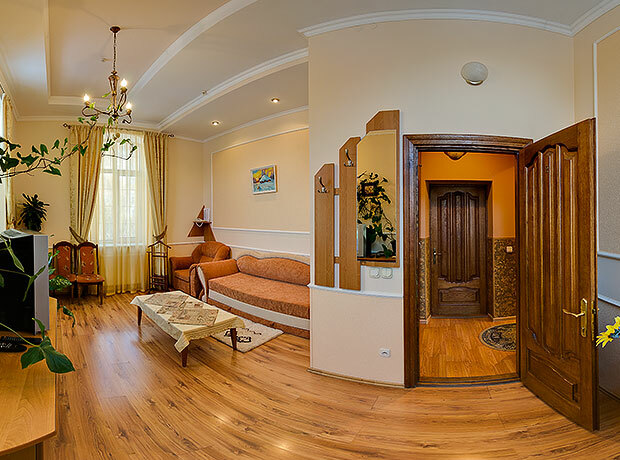 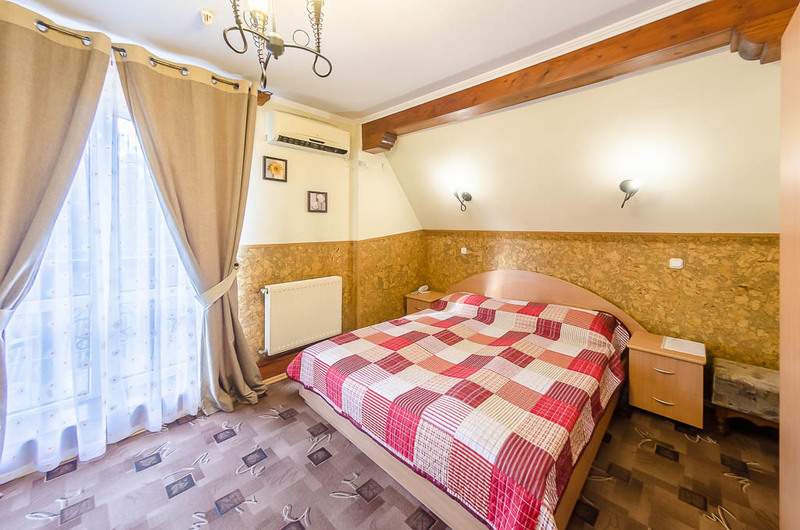 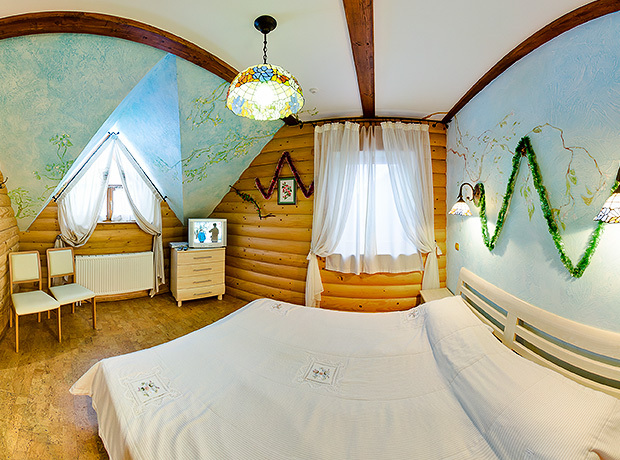 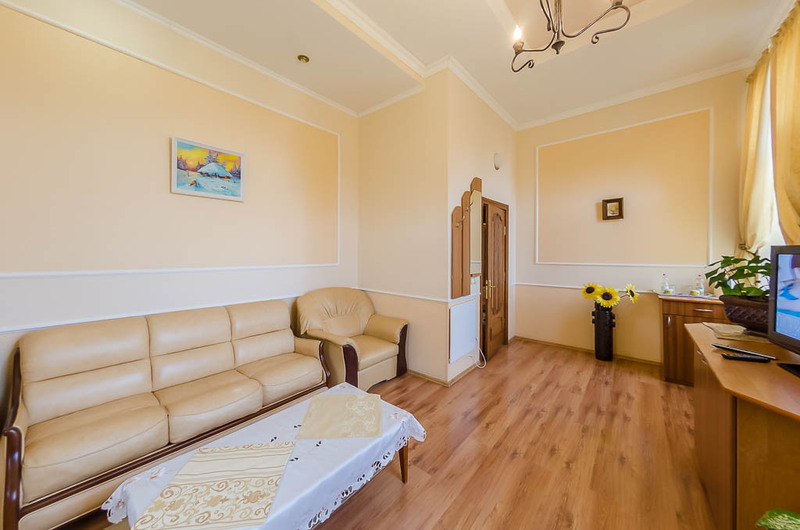 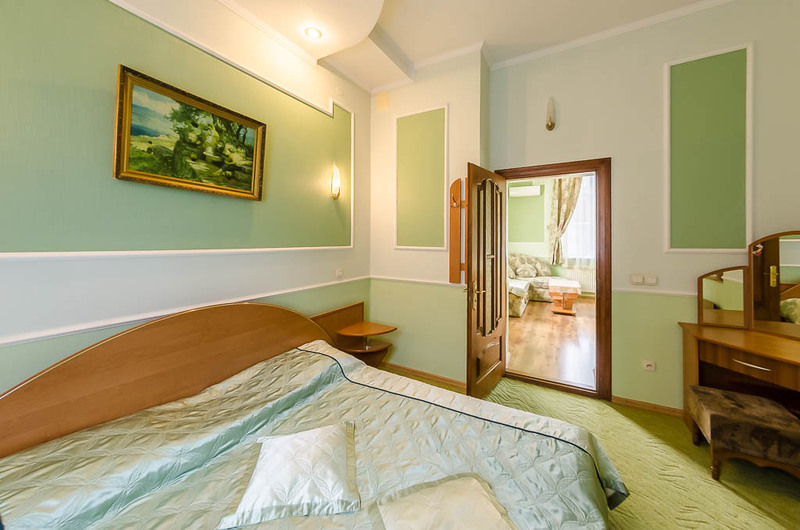 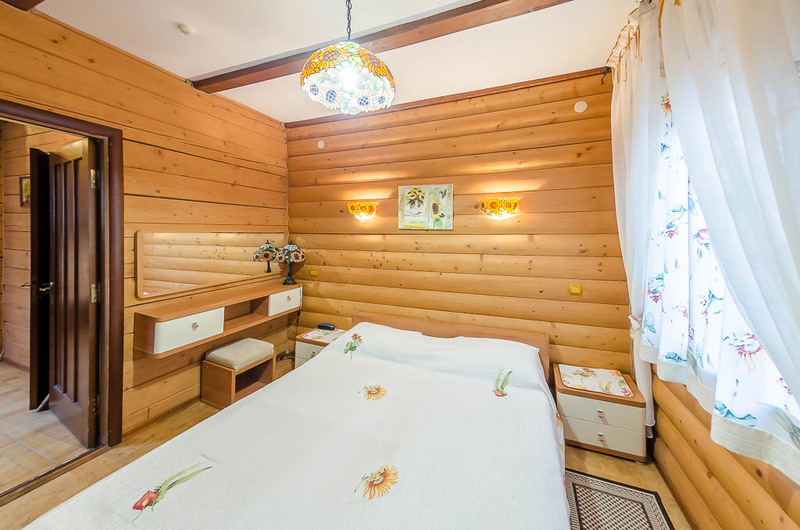 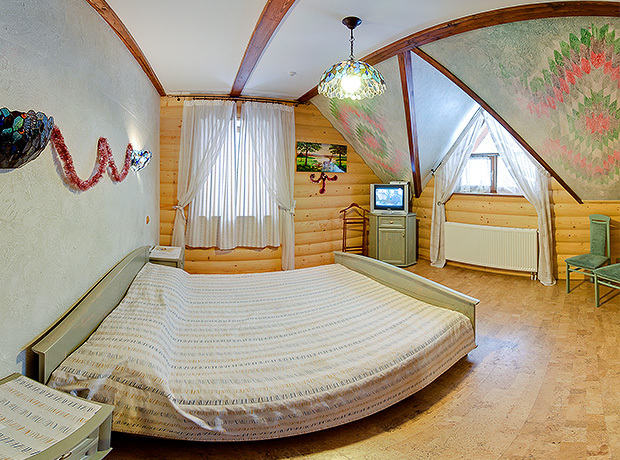 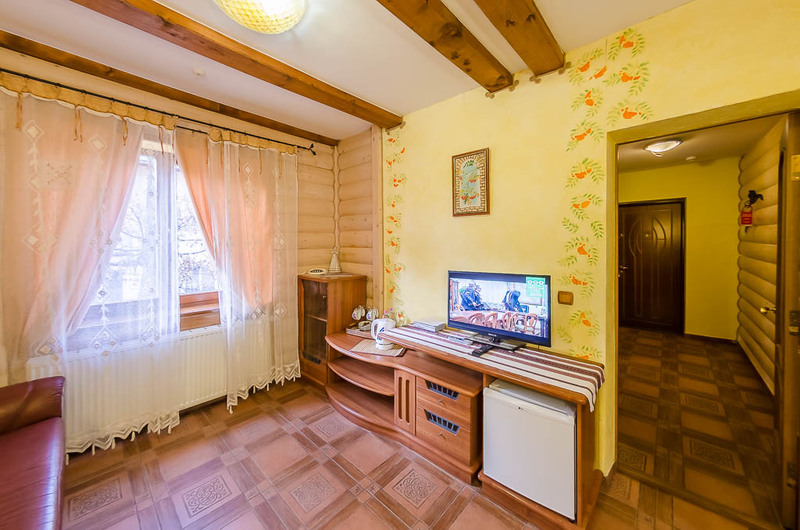 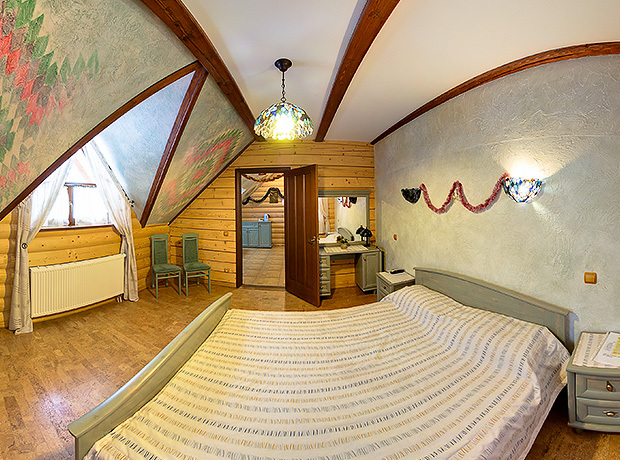 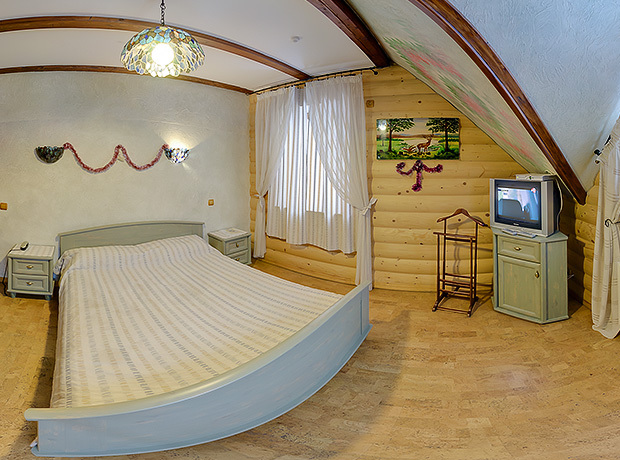 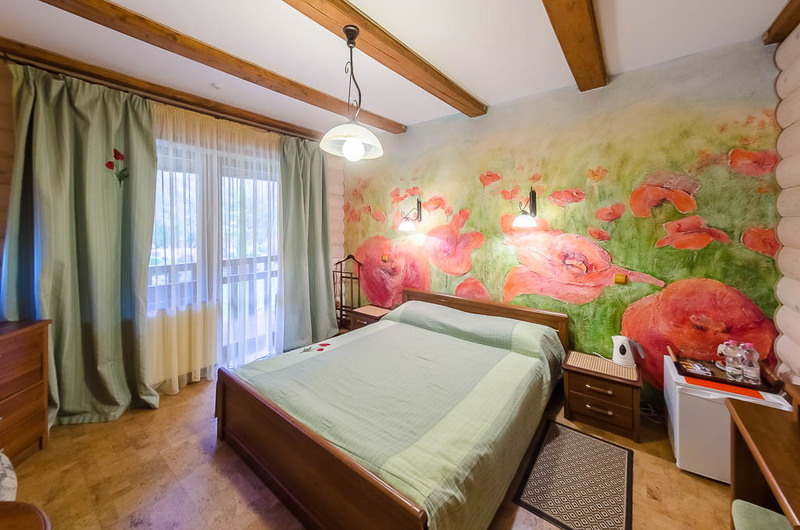 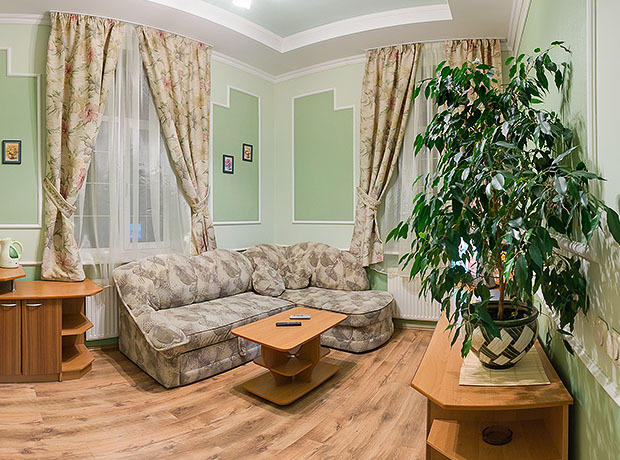 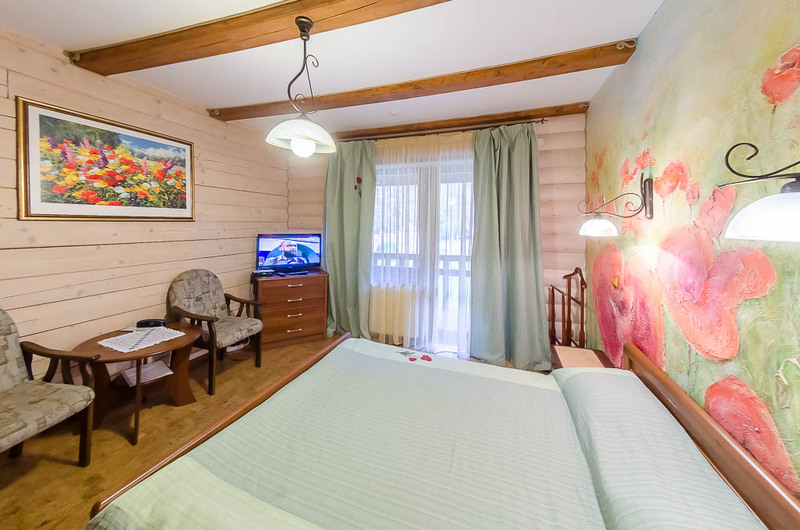 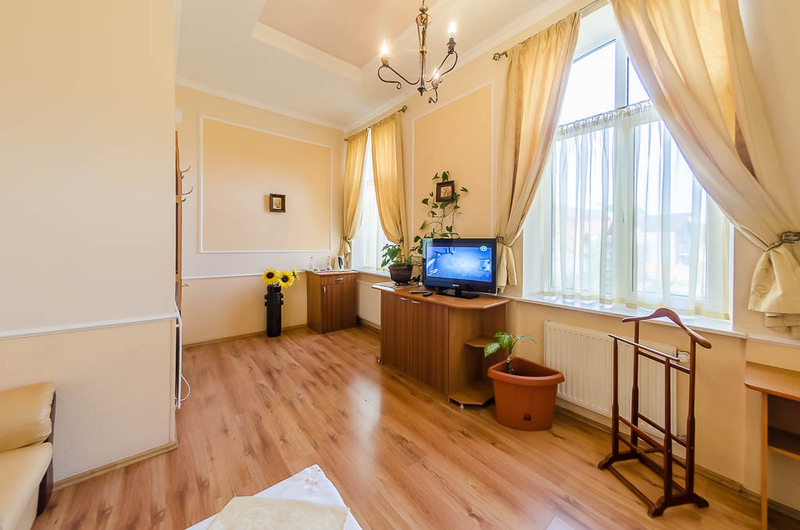 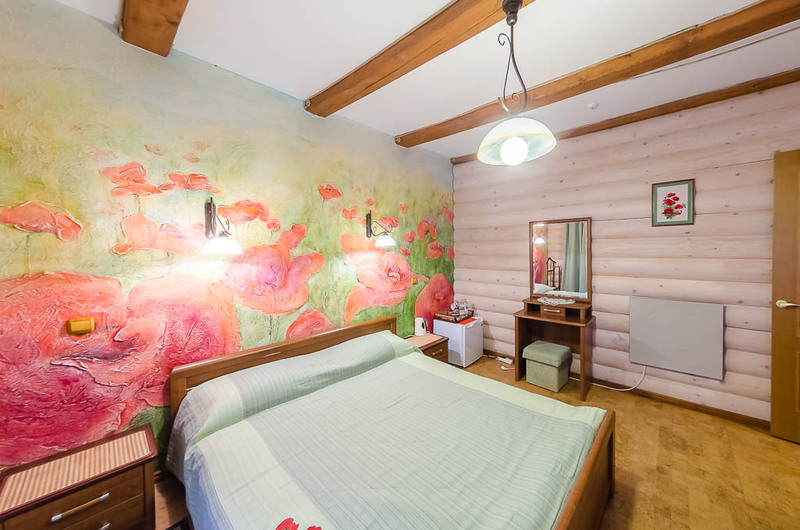 The «Krasna sadyba» hotel offers elegant rooms for every taste — from cosy single rooms to exquisite 2-room luxury apartments. 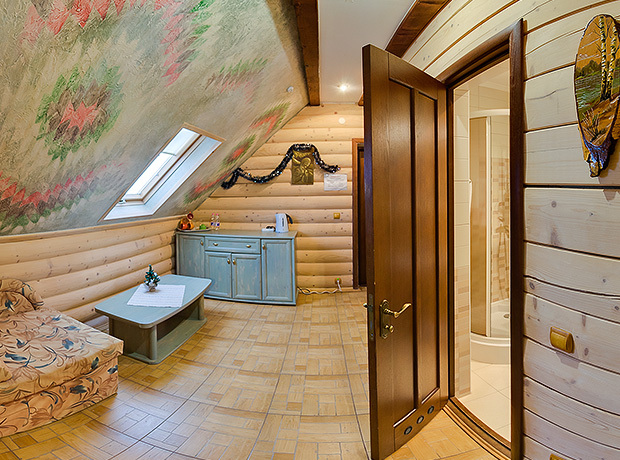 There's a bath in luxury suites, other rooms have a shower. 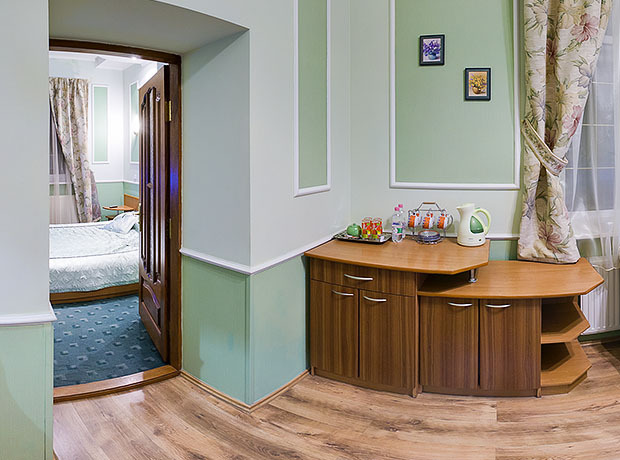 There's a TV, an electric kettle, a fridge, tea, coffee and mineral water in each suite. 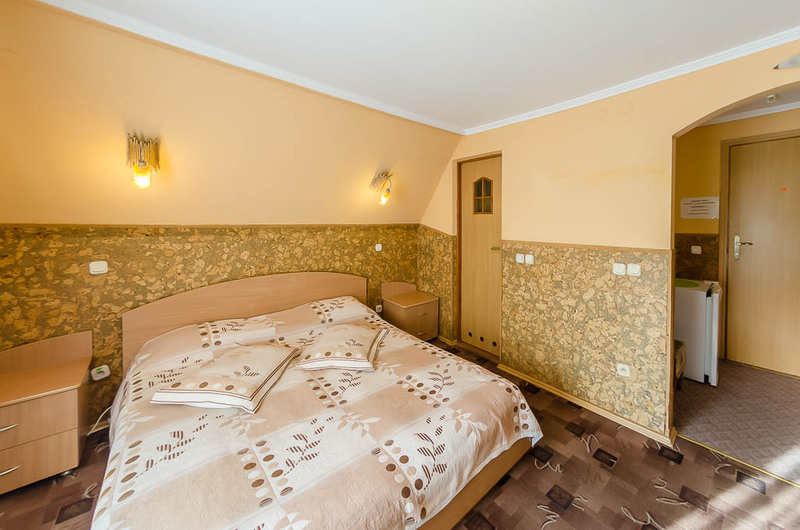 Naturally, there is also a bedding set, sanitary facilities and a hairdryer. 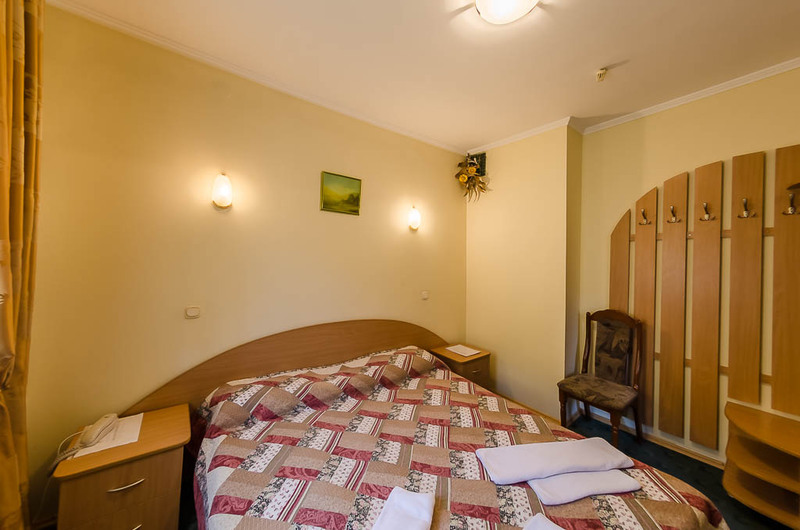 Rooms in the second building intercom with the administrator, the cafe and the restaurant. 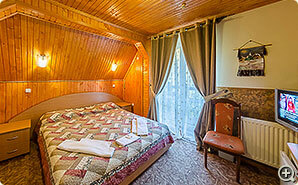 Therefore, you can place an order at the restaurant or the cafe without leaving your room. 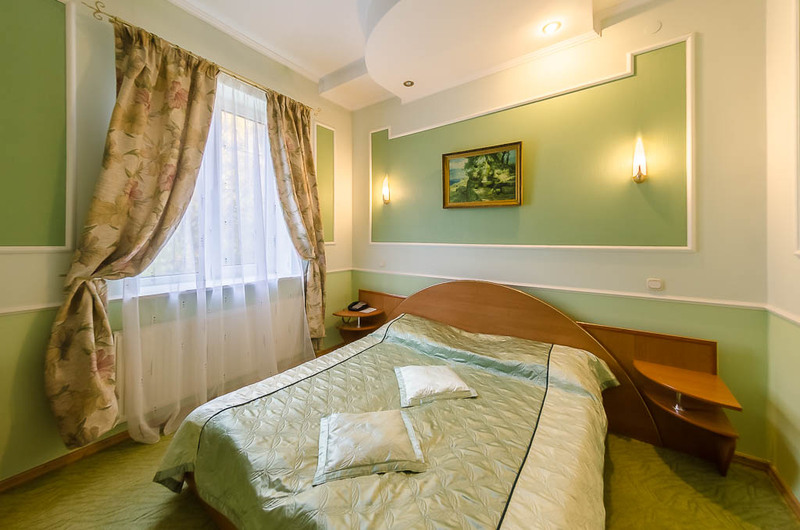 For your convenience, the food will be brought to your room, or a table in the restaurant or the cafe will be laid at the appointed time. 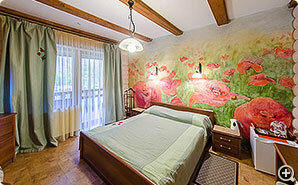 Remember that the lodging price includes breakfasts in the cafe. 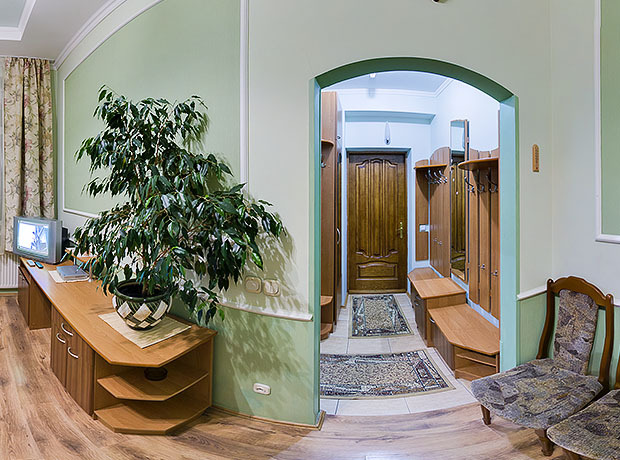 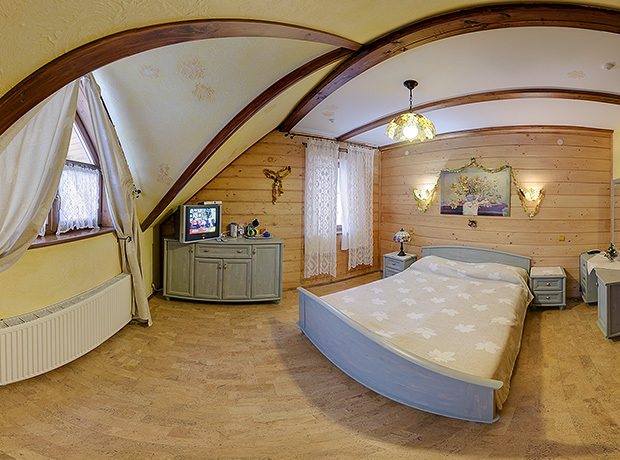 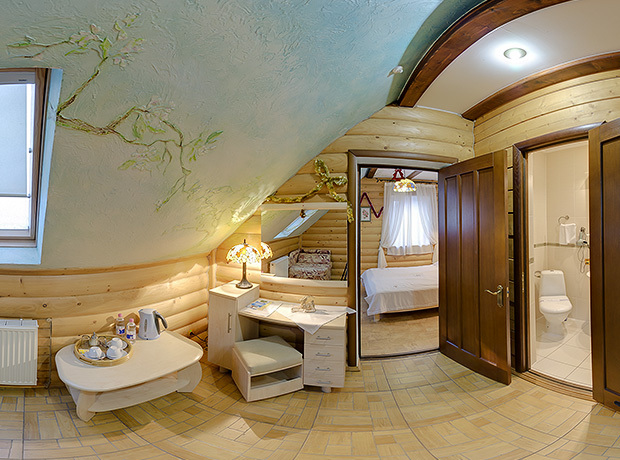 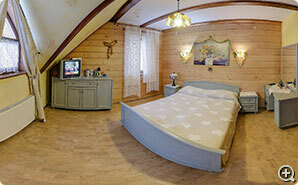 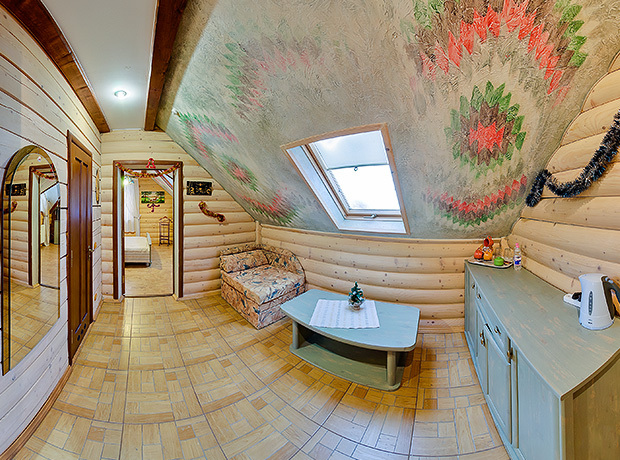 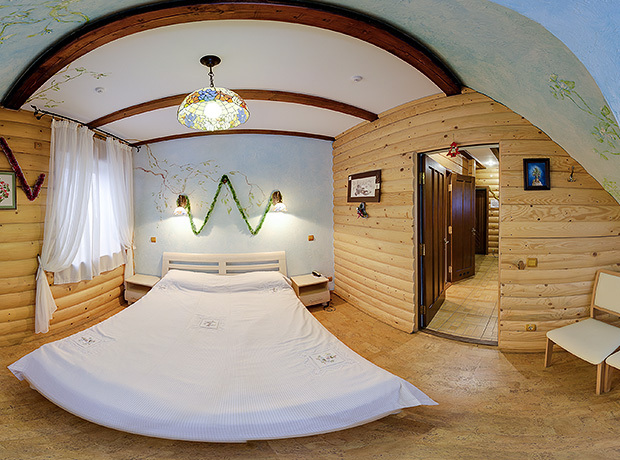 For an easier choice of a room to your taste, we suggest using the virtual tour, where you can easily view any room. 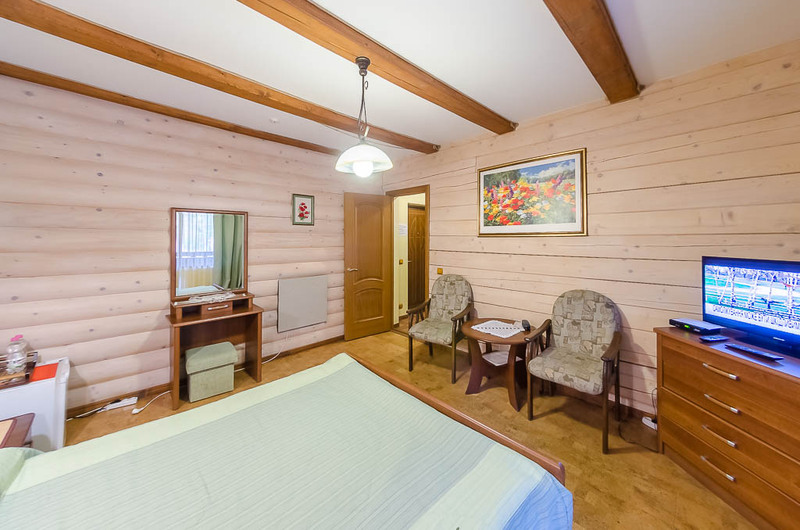 All our luxury suites have two rooms, so they will be the perfect choice if you decide to stay here with the family or if you travel with a small company. 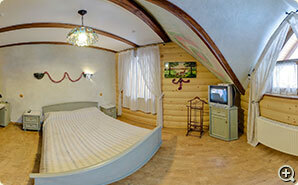 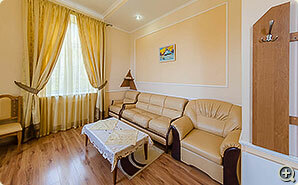 There is a lobby, a bathroom, one room with a double bed and a living room with a sofa, which can accomodate two persons. 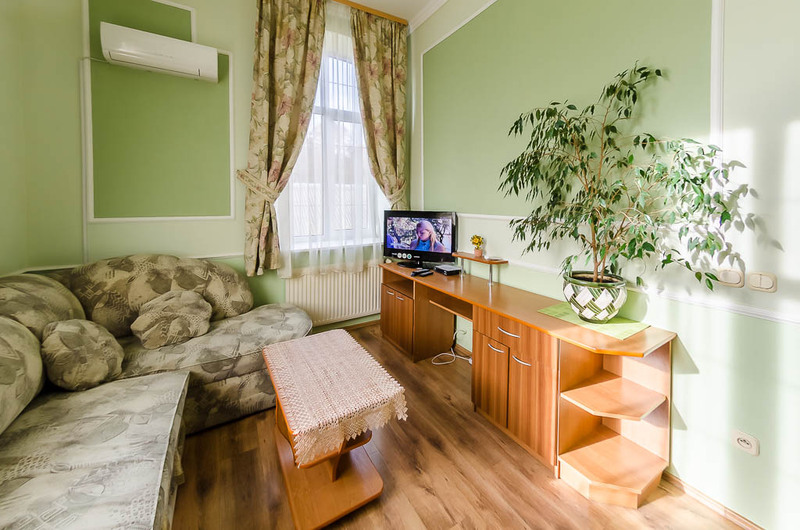 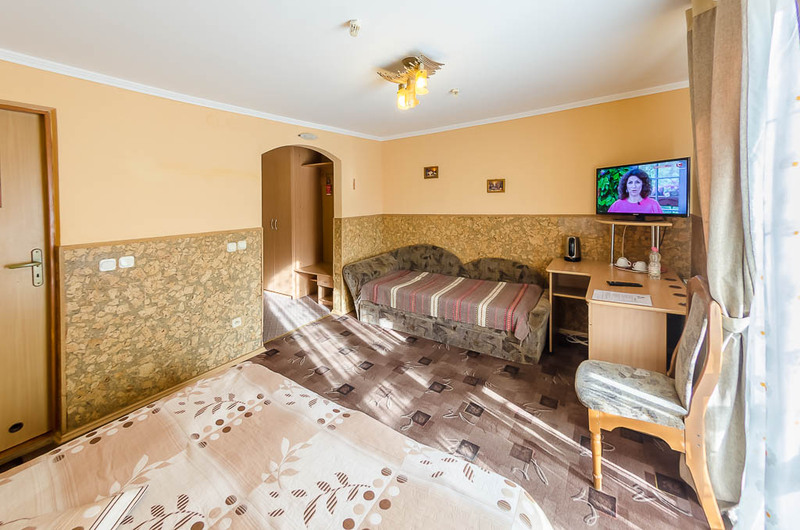 The bedroom and living room both have a TV, comfortable chairs and cabinets, and in the lobby or in the living room there's a compact refrigerator. 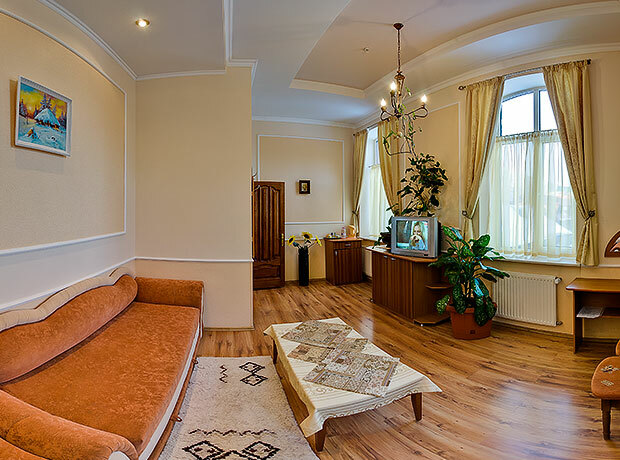 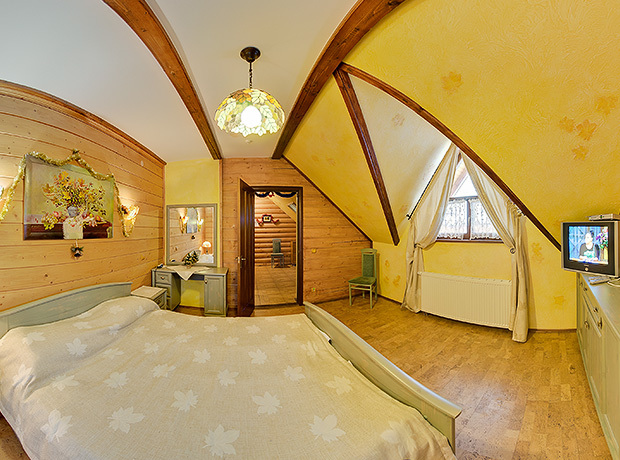 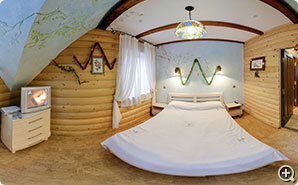 We offer three types of semilux suites — single, double and triple. 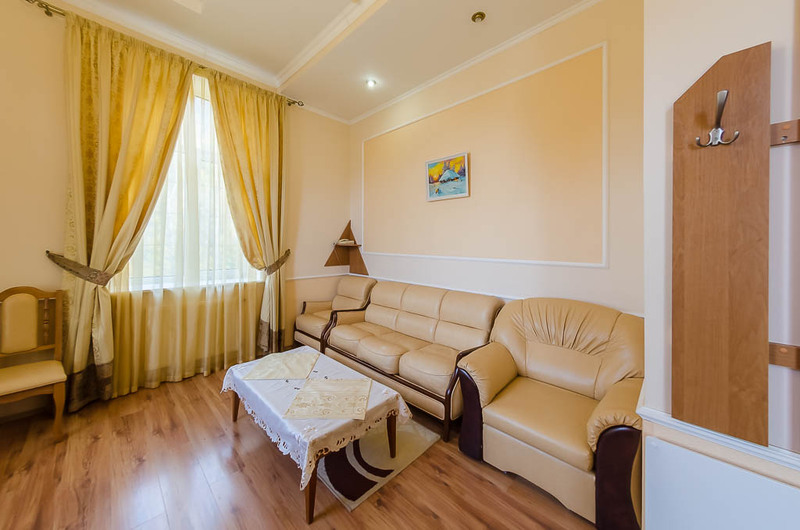 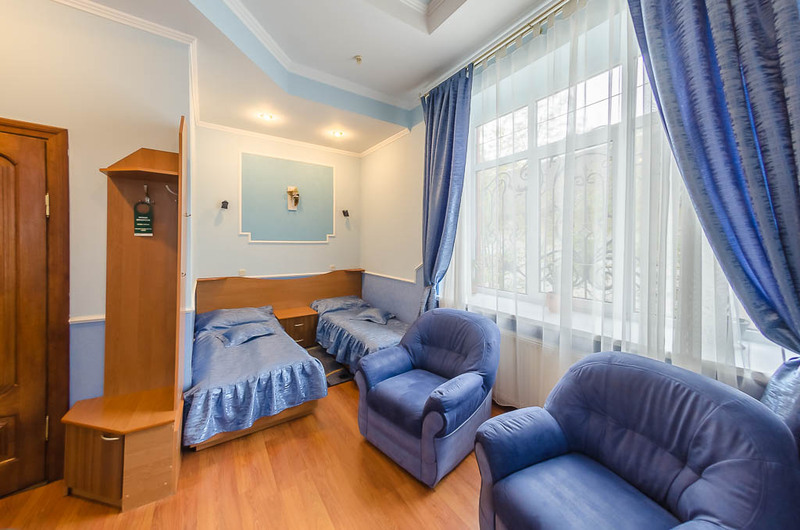 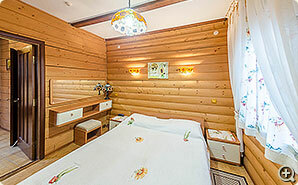 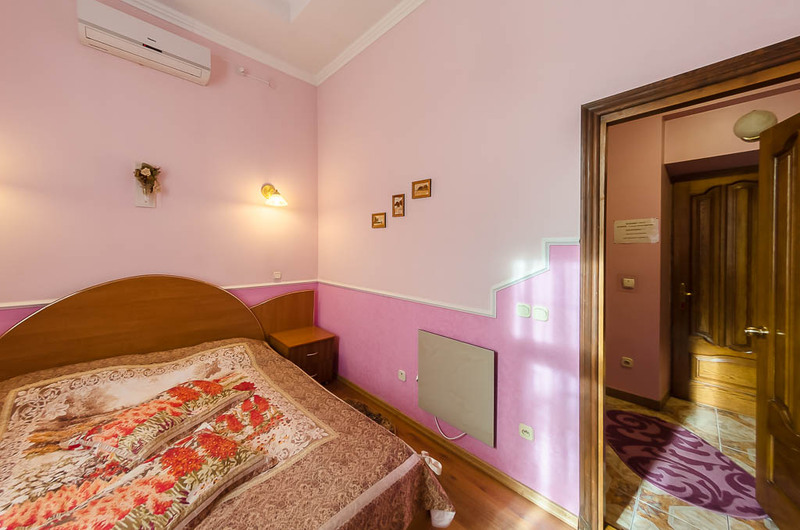 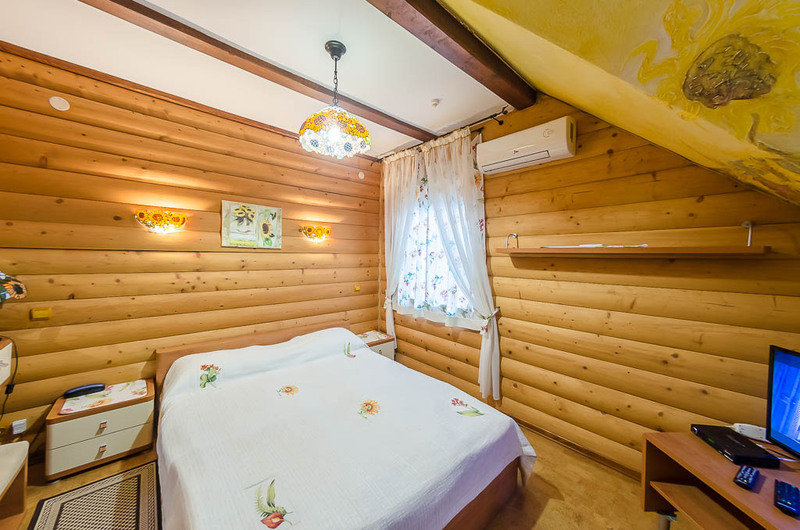 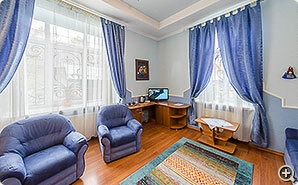 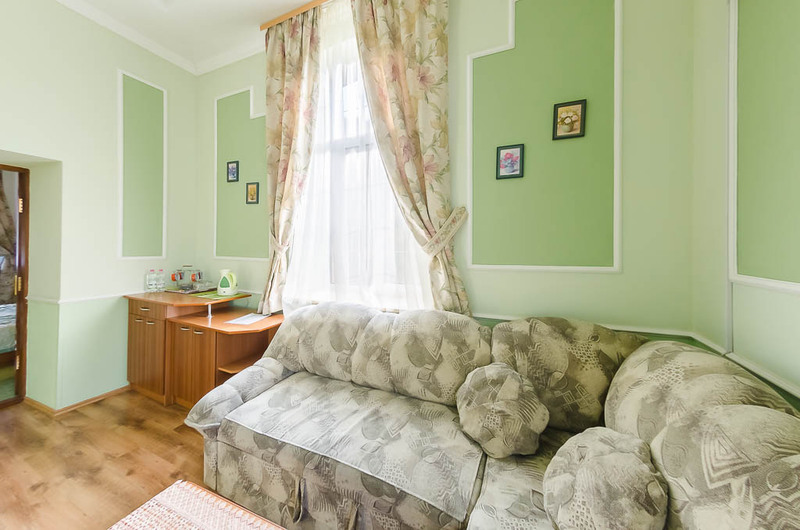 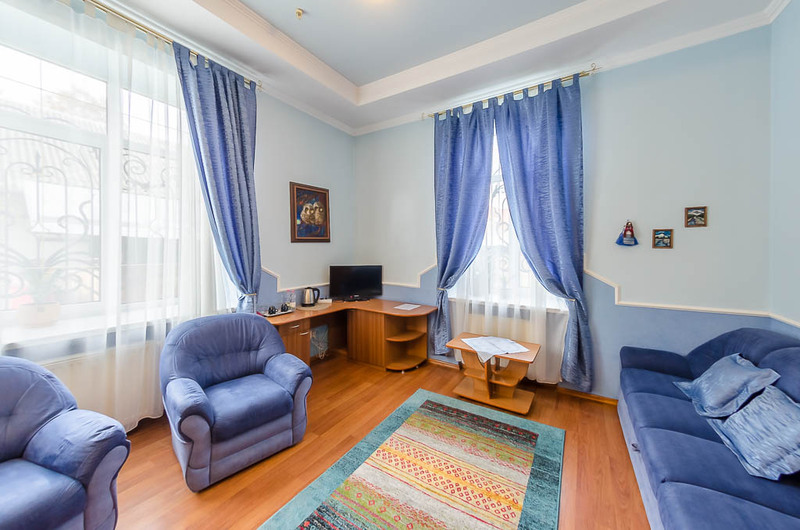 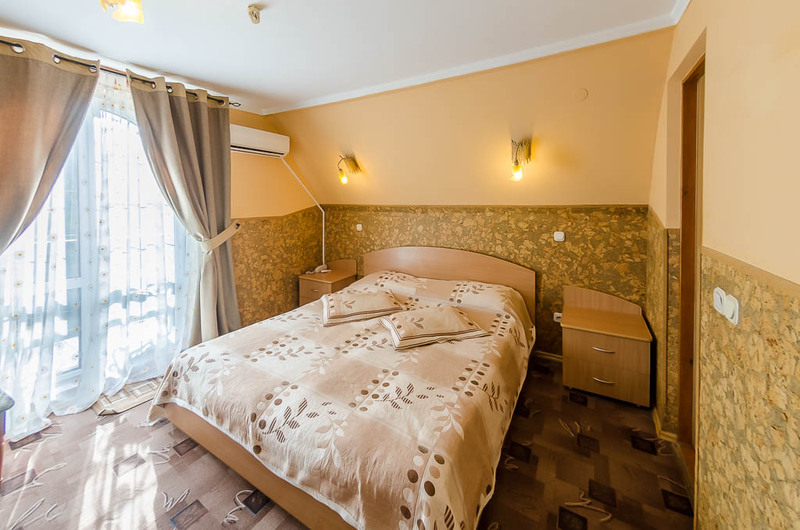 The single room will suit you if you are alone, the double room is the best choice if you're with your soulmate or a friend, and the triple room will suit you when you're travelling with your spouse and a baby, for example. 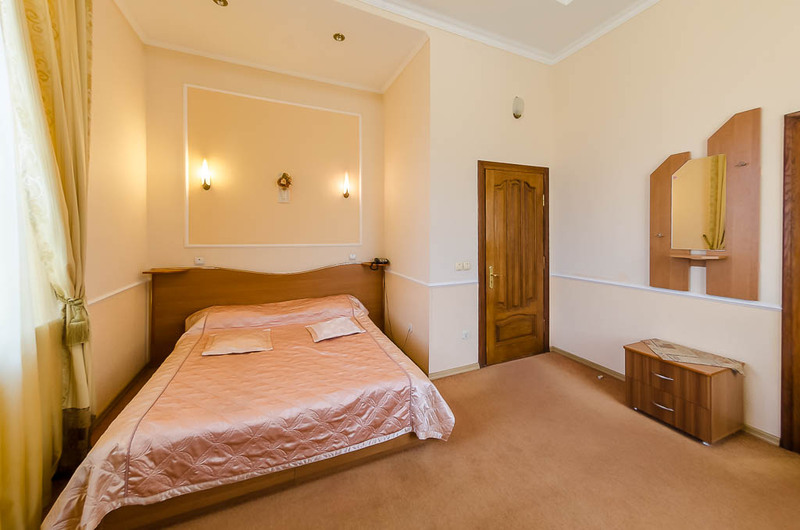 Semilux suites feature an entrance hall, a living room, a shower room and a room with a comfortable double bed and closets. 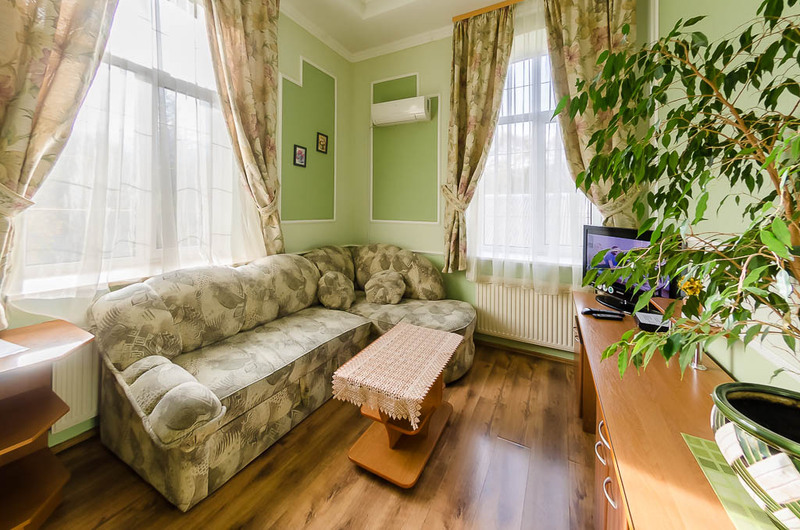 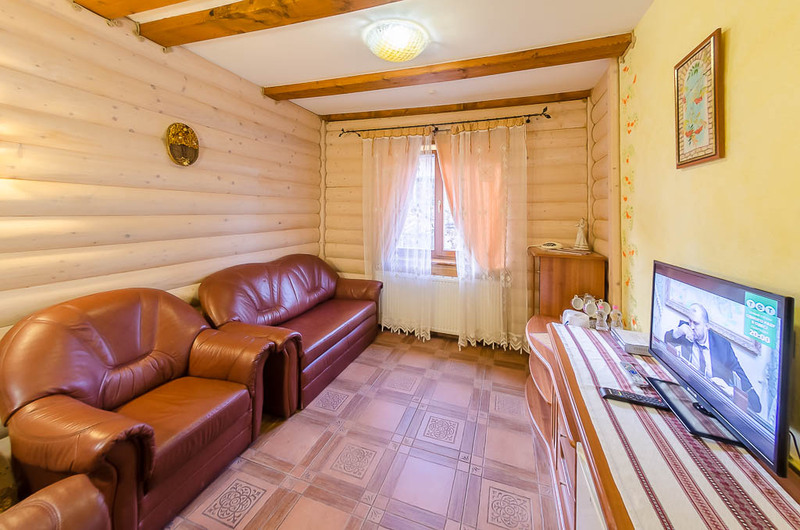 The living room has a refrigerator, table and cabinets, as well as a comfortable sofa for one person. 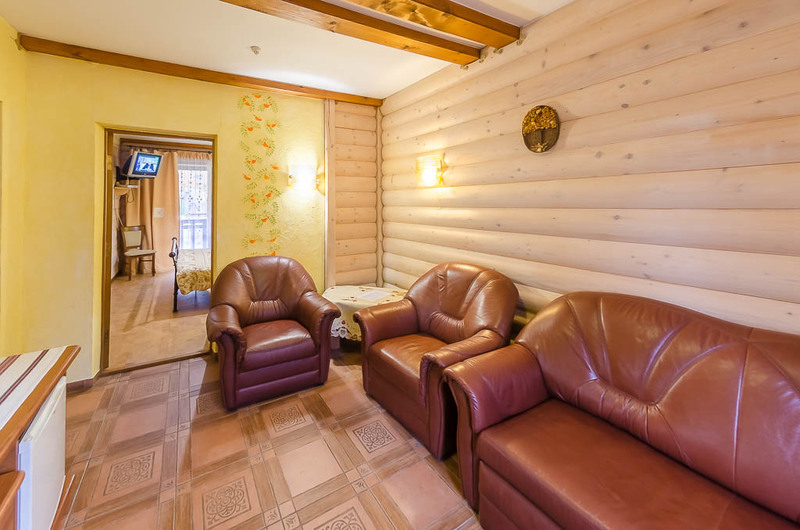 Economy suites feature a cosy room with a comfortable double bed, a TV, tables and cabinets. 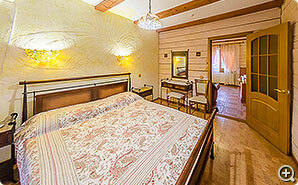 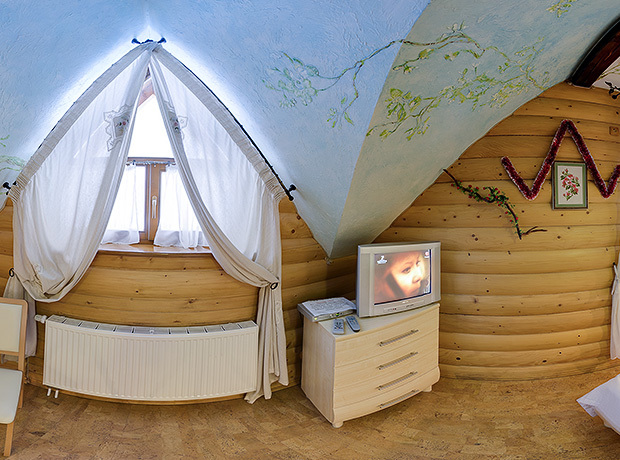 These are cosy suites at the most affordable price. 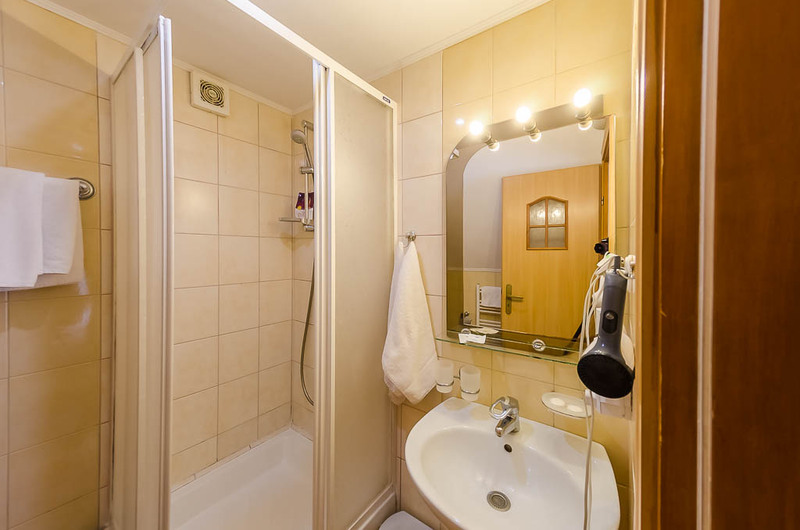 The shower and the bathroom are shared and are situated on the second floor of the first building.